I absolutely LOVE my Grandmother bracelet! It’s is beautiful, well made and I will wear it every day! Thank you! I have given these bracelets to many friends and family for various occasions. The bracelet is always a hit, always arrives as ordered and always of the best quality. The bracelet is beautifully made. 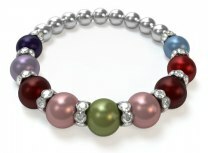 I wear it next to my silver wrist watch so the combination of the silver and crystal beads compliment each other nicely. Ordering was simple. Shipment arrived in a matter of days. Excellent product. Excellent service. Highly recommend. Easy to add another bead! I bought the mother's bracelet for a grandma celebrating her 70th birthday. I was surprised how beautiful the bracelet is. Great gift for a reasonable price. I just love the mothers bracelet but I’m using it as a grandmother’s bracelet. I only wish I got it a little smaller. Measure carefully.